Hello friends, I am back today with my updated homemade laundry soap. I have made it a few different ways in the past but this updated recipe is my favorite! 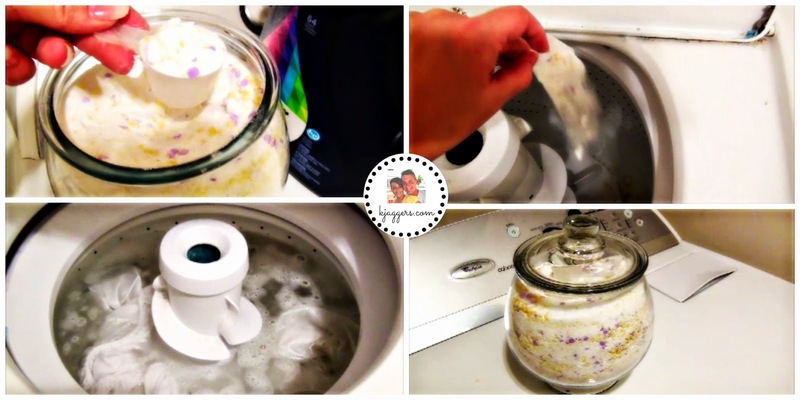 Its super easy and cheap to make and is really effective in cleaning the laundry. If you want to see how I make it, everything you need to know is in the video! More pictures and full recipe below. As I said, I have tried a lot of different methods. This was one of them which I grated ivory soap. It worked great and I liked the way it looked in the jar but I quickly grew tired of grating soap. Then new items were coming out like the Downy UnStopables that go into washer rather than the dryer. So it incorporated rather nice into the recipe. Also I am using the Fels Naptha soap that I found in Wamart for about $1 a bar. Last time, I couldn't find it and used the ivory. Both work well. To grate the Fels Naptha I decided to not use the grater and instead use my food processor. I found it easier to add a little bit of the Oxygen Powder to help the blades chop up the soap. Use a large container ( even a garbage bag works ) to mix up the soap and rest of the ingredients. You need to really take your time and make sure its well incorporated. Use two or three scoops per load ( depending on the size of your washer ) and don't worry if it doesn't suds up as much as other laundry soaps. It will suds a little but not a lot. Cleaning power of any soap does not depend on suds...so don't worry! Also this is perfectly safe for HE washers. The key is a fine grind! No big, bulky chunks…as HE machines use less water and don’t break down large chunks of soap. I like to use the rubbermaid storage container to mix and store the laundry soap on the top shelf of our laundry room. But for convenience I keep a glass container on my dryer for easy access. This recipe will last you a long long time. It really depends on the size of your family and how much laundry you do. For most people I think one batch will last a family of 4 at least 6 months. But again it depends on the size of your family and if you are measuring correctly. Its cheaper, it works just as well if not better than store bought laundry detergents and easy to make. I think giving these out to family and friends for holidays or whenever is a great way to share the love. My sister is a working college student and I just made her a batch that I will give her in a couple weeks. I would love to hear from you if you have a homemade laundry recipe that you love ...if you care to share! If you have any questions leave them below or on youtube! Stayed tuned for a quick laundry tip that has to do with softener sheets or the lack there of!